Cuddle a koala at the world’s largest and oldest koala sanctuary. Lone Pine Koala Sanctuary is located only 12 km from the CBD and has provided a haven for sick, injured and orphaned koalas since 1927. The sanctuary is now home to over 130 koalas. Take in the breath-taking, panoramic views from Mt Coot-tha. At 300 m high, Mt Coot-tha allows you to overlook Brisbane and Moreton Bay. Walk through Queensland’s premier subtropical botanic gardens, enjoy a picnic or settle in at the cafe or restaurant. Climb the Story Bridge for a different view of the city. Climbs of this heritage listed bridge commenced in 2005 and there are now several different climbing options to choose from. Take a relaxing City Cat ride up and down the river. The City Cat ferries provide a relaxed, enjoyable way to get around this river city. Summer time brings warm to hot temperatures and school holidays. Because of this many people prefer to visit during the cooler months of the year. June to November is when the majestic humpback whales migrate up and down the east coast of Australia. In May to June females begin heading for warmer waters to give birth to their babies. After time to grow, mothers and babies then take the long journey back to their chilly Antarctic home. Take a whale-watching boat ride, or head to Point Lookout touted as the best spot for land-based whale watching. Being a subtropical climate, Brisbane enjoys clear winter days with brisk mornings and cool evenings. Days with endless blue skies are to be found at this time of the year. Summers are often hot, humid and wet, subject to regular tropical storms. Ah Brisbane, what’s not to love about such a vibrant, friendly city? Brisbane was first inhabited as penal colony when the Redcliffe site was relocated in 1825. 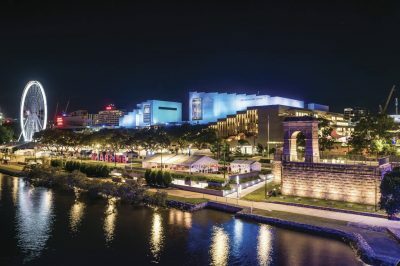 After increasing pressure, the region was finally opened to free settlers in 1842 and was declared the capital of the newly established colony of Queensland in 1859. The city has been struck by disastrous floods over the years. However, the resilience of the river loving locals is evident when gazing at the flood levels marked on the side of the Regatta Hotel in Toowong. South Bank Parklands offer a man-made beach to escape the summer heat, along with beautiful parklands and world-class dining.